Heat a kadai with a tsp of butter or ghee. Add the chopped onions and sauté till they turn translucent. Add the chopped capsicum and tomatoes and fry for 3 to 4 minutes. Add the crumbled paneer, chaat masala, garam masala and salt to taste. Mix well. Saute for another 2 minutes. Let this cool. Apply butter on one side of the bread slices. Place the paneer capsicum mixture on the unbuttered side of the bread slices. Close with another slice and press lightly. Toast the sandwiches either in a sandwich maker or on a tawa. You can add chopped green chillies, I omitted them since I was making it for my lil one. Perfect combination...I can feel the taste of paneer n capsicum..yummy yummy! 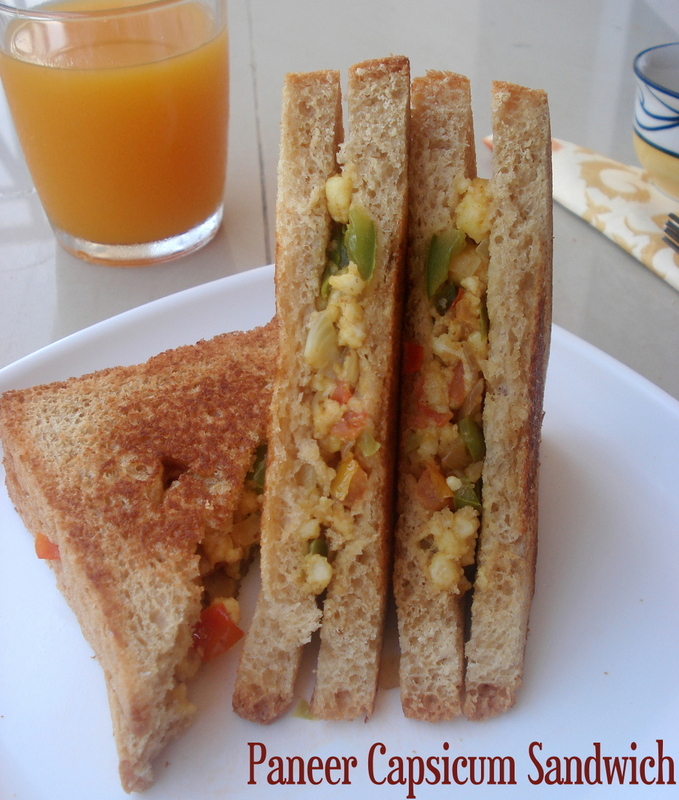 Delicious and healthy sandwich with paneer and capsicum Kaveri. 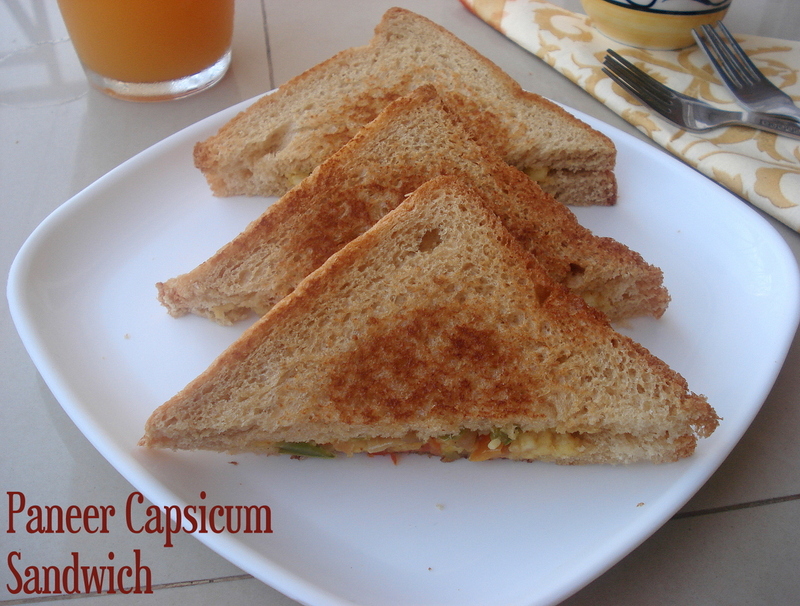 Love this combo, paneer and capsicum, yummy sandwiches.. 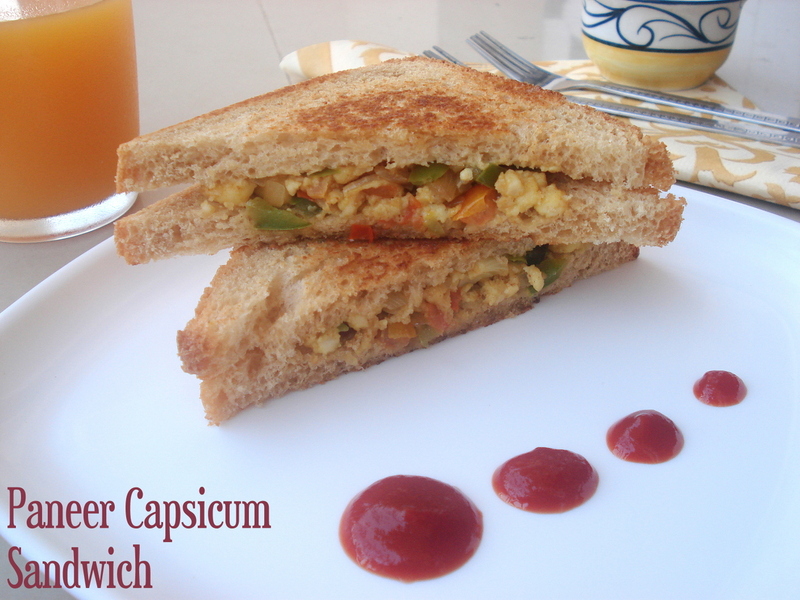 Sandwich looks delicious and love the combo of paneer and capsicum. Perfect and healthy breakfast. yummy too. Love this paneer and capsicum combo in anything, sandwich looks prefect and definitely super filling. Perfect looking sandwiches, love the paneer in the filling. Lovely sanwishes.see even my spelling seems to be wishing. Sounds like a great sandwich.I am sure Aishwarya too would love to take this to school .